Setting your calorie intake levels to the right amount can help you lose weight and still maintain the best possible nutrition. 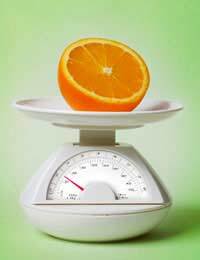 There are three ways of determining the right calorie intake for you. For some people a rough and ready system is good, for others, a doctor’s advice is essential and for others, having an understanding of their current eating behaviour and tailoring their own programme is the ideal motivator to establishing and maintaining calorie control. The first is to use one of the many calorie calculating tables which allow you to input your weight, height, age and activity level into an online calculator that then assesses your calorie intake and your actual calorific needs and advises you of the maximum daily amount of calories you should eat. The second way is essential if you have any health issues, if you believe you are pregnant or if you think you could be classed as severely overweight. In this case you need to visit your GP or practice nurse and ask for a weight loss advisory programme. They will weigh you and take your blood pressure and may also give you a cholesterol test to check your overall health and this will produce a tailored calorie target for you, often accompanied by advice on exercise. The final way is the longest but if you are in normal health, may deliver the most tailored results. First you need to obtain a good set of guidelines to the calories in foods. Then weigh yourself. Now you need to keep a journal of everything you eat for at least a week, and preferably a month, so that you can calculate your daily calorie intake. You’re not changing your diet at this point, just measuring it. After counting your calorie intake for your chosen period of time, weigh yourself again under the same conditions as previously – in the same clothes at the same time of day. Now you need a calculator. Divide the number of calories you’ve consumed over the entire period by the number of days, so if you ate 78,324 calories in 30 days, you’ve consumed 2,611 calories a day. If you’ve put on around a pound in weight, you’ve eaten around 3,500 calories more than you needed, as each pound in weight gained is more or less 3,500 calories consumed. This means that to have stayed at the same weight you should have only eaten 74,824 calories in that month, or 2,495 calories a day. If you wanted to lose a pound in a month, you’d have to reduce 74,824 by 3500 and eat only 2,377 calories a day. This method is time consuming but very accurate as long as you monitor your calorie intake honestly and carefully. It can’t be used for periods of less than a week, as nobody’s diet can be guaranteed to be typical over a shorter period and 30 days is ideal. Equally this system isn’t accurate if you pick a period when your eating patterns are unusual, say when you’re on holiday or at Christmas or other festivals.